Dr Tim Minshall has been appointed as the inaugural Dr John C Taylor Professor of Innovation at the University of Cambridge, a new post that will build on the University’s strengths in science, engineering and entrepreneurship. Dr Minshall, who is currently Head of the Institute for Manufacturing's Centre for Technology Management, Reader in Technology & Innovation Management in the Department of Engineering and Fellow of Churchill College, will take up his new post on 1 October. 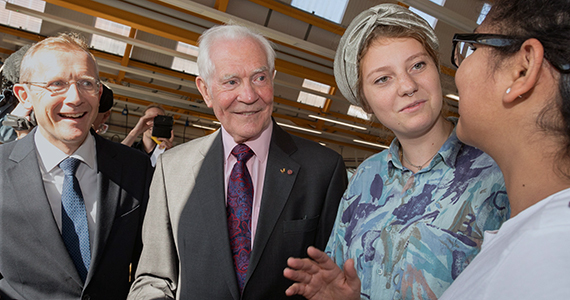 The new professorship has been made possible thanks to a generous donation of £2.5million from Dr John C Taylor OBE, one of the most successful British inventors of the last 50 years. Dr John C Taylor OBE (left) with Dr Tim Minshall at the IfM. Prior to joining Cambridge’s Institute for Manufacturing in 2002, Dr Minshall worked as a manager and then a director of the St John’s Innovation Centre – one of Europe’s most successful incubators for technology-based start-ups. Since joining the University, he has played a very active role in the development of innovation and technology management activities throughout the University. He also works closely with companies in the Cambridge cluster, the largest and most successful technology cluster in Europe. He has been involved in a broad range of regional and national policy activities to support innovation. “This professorship presents an extraordinary opportunity to address how we define and develop the innovation skills and capabilities of engineers so they can address economic and social needs: a challenge that has become critical for the UK given the current global economic and political context,” said Dr Minshall. In addition to his research in technology and innovation management, Dr Minshall is also a committed teacher and supporter of engineering outreach to the public. He teaches undergraduate and postgraduate students at the University, runs outreach programmes with local schools, and mentors students and researchers to develop their public engagement skills. “The development of future engineers is at the heart of my work,” he said. In his new role, Dr Minshall will continue to build on his strengths in innovation and technology management, both in the University and in the UK more broadly. “The UK has long been superb at invention – the creation of new ideas – but we need to develop a generation of engineers able to create and capture value from these new ideas, and provide these innovators with the capabilities to respond to future challenges and opportunities throughout their careers,” he said. “This requires us to take a much more joined-up, long term view of technology, management and policy issues”. Dr Taylor’s life’s work involved inventing small electrical components that are vital to many other products. Early electric kettles would not turn off when the water was boiling, meaning that they needed constant supervision and were in danger of melting and starting fires if they were not properly attended. Dr Taylor created the solution to this problem by supplying a small, bimetallic thermostat to domestic kettle manufacturers which would switch off the kettle element when the water started to boil. This invention did not dictate the vessel design, being suitable for metal and plastic jugs and kettles, and providing a universal solution used over a billion times daily. Having continued to innovate throughout his life, Dr Taylor now has over 400 patents to his name and is a Fellow of the Royal Academy of Engineering (FREng). In 2008, he created and donated to his former college the popular Corpus Chronophage Clock, positioned outside the Taylor Library at Corpus Christi College, Cambridge, which has now become one of the city’s most popular tourist attractions.